Her smile widens as she hears the familiar language – Sinhala. “You know Sinhala?” she asks. 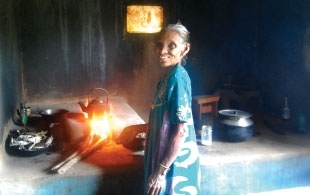 Piyaseeli, a domestic aide, has been living in Tharmapuram, 20 kilometers east of Kilinochchi, a shade over four decades. She has seen, experienced and shared the harrowing experiences of 30 years of war with thousands of people in the area popularly known as the Wanni. Having lived in a predominantly Tamil area, it was not often that she came across people speaking the language spoken in the rest of the country. Originally from Matara, Piyaseeli moved to Kilinochchi with her husband in 1972 and has been living there since. For Piyaseeli, life brought many uncertainties after moving to the Wanni. Little did she know that the Wanni would soon be a war zone, in years to come. “We came here seeking a quiet peaceful life,” she says. Life was not easy for her and her husband during the initial stages in Kilinochchi. Having moved from one end of the country to the other, Piyaseeli and her husband’s challenges were not limited to getting accustomed to the new environment and its people. They needed to ensure that the hosts were comfortable with them. She was not accepted by the community. It took two years for the couple to convince the people that they were in Kilinochchi to make a decent living. “Even though my husband is a Tamil of Indian descent, I am Sinhalese and was not accepted by the people at the time. They were doubtful. They felt really uncomfortable and were suspicious about us,” she said. Therefore, Piyaseeli and her husband lived an isolated life, until the people were accustomed to their presence. “We were virtually in hiding for some time. But eventually things changed and we were able to move freely,” says Piyaseeli. However, Piyaseeli’s problems were not to end there. The worst was yet to come and was to remain for decades until May 2009. It was not only the final stages of fighting that affected them. The run up to the climax was also filled with tension, displacement, uncertainties and fear for the people in the former war zone. The fluctuating, volatile security situation in the country was centered around the Wanni. Kilinochchi gained the attention of many during the war, as it functioned as the de-facto administrative center of the LTTE for decades until it was regained by the security forces in January 2009. For Piyaseeli, life in Kilinochchi was like living in a totally different country. The Wanni was completely cut off from the South during a major part of the fighting. The people lived in isolation with no way to contact their relatives in other parts of the country. Despite all the obstacles, Piyaseeli and her family continued with their lives, as all others in the region. “It was difficult. We could not get out. We could not keep in touch with people who were living as close as Jaffna. But, I was not the only one helpless here. There were thousands,” she said. Forty years later, Piyaseeli looks at all the experiences she gained in a positive light. She was one of the thousands who had to run for their lives during the final stages of fighting. Having lived there 40 years, being a victim of conflict was not new to Piyaseeli. She moved there even before the LTTE came into the scene. She has gone through almost all the phases of the ethnic situation. However, she says the final stages were the worst that she faced in her entire stay. “Every single person was affected in one way or another. We suffered a lot, not knowing where to run and where to find safety,” she said. Her Tamil accent is still different from what is generally spoken in the North. But, Piyaseeli has become just another person in Kilinochchi. Her husband is no more. All her children are married to residents of Kilinochchi. “This has been my home and will continue to be so. I love the place, the people and everything that is here. They have been with me in hard times. I will be with them when they are happy,” she smiles. The life of Piyaseeli is just one example. She is just one stone for the bridge that is needed to connect the two communities that were separated for years.